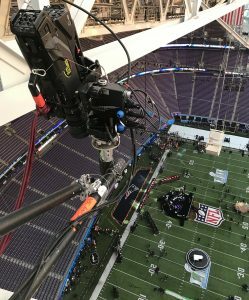 NBC Sports’ Super Bowl LII production yesterday used one of the largest complements of 4K cameras ever, with four Sony HDC-4800’s and three HDC-4300’s in 4K mode deployed at U.S. Bank Stadium. Fletcher played a key role in this 4K-centric production, providing not only the 4K cameras but also five Sony PWS-4500 production servers. Fletcher mounted a Sony HDC-4800 4K robotic camera at each end zone for a definitive look on close plays along sidelines or back lines. Two of the HDC-4800’s were mounted in new robotic positions: each overlooking the whole end zone to create a definitive look on close plays along the sidelines or back lines. The other two HDC-4800 robos covered both goal lines. In addition to the 4K cameras, Fletcher deployed six Sony P1 robos throughout the stadium for NBC’s game coverage: four hallway cams, one in the booth, and a beauty shot at the stadium’s Delta Club. NFL Network tapped Fletcher for its robotic-camera needs, deployed a camera in an outdoor housing at the corner of Sixth and Nicollet for shots of the Super Bowl LII ice sculpture. In addition, NFL Network rolled out a robo for beauty shots at the Convention Center, which were also made available for other NFL broadcast partners.